As I was rolling along on my inline skates the other day, I experienced some noticeably heartwarming interaction with the passersby who were out in numbers to enjoy some exercise on that particularly beautiful day. Too often there seems to be a tendency for people to avoid each other in our increasingly busy and impersonal world when, instead, we could be invigorating each other with pleasant purpose. 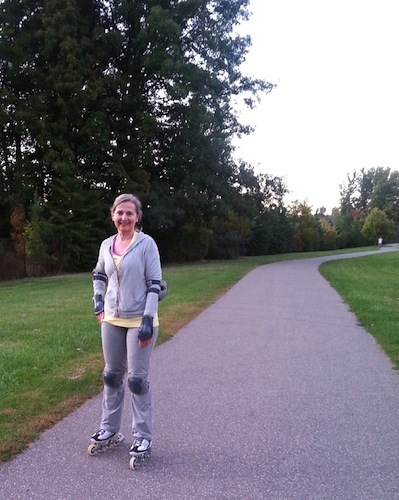 On the paved nature trail where I rollerblade, many of the people who usually looked straight ahead as I passed by on earlier occasions actually looked up and smiled back at me as extended my smile and greetings to them. I could feel their exuberance as we met eyes and smiles. It gave me a sense of community on that trail, where we were all out getting our regular exercise together, but where most usually kept to themselves, as if absorbed by a fear of strangers. The benefits of smiling are enormous to our wellbeing and can be contagious! Of course, when I first started out on my new rollerblades almost six weeks ago, I had presented myself as a bit of a clown, as I reeled and corrected my balance almost the entire time I headed up the slightly sloping trail. On the way down I would stabilize my center of gravity by holding my knees, like a child when learning to ski or skate. Some people would giggle as we passed each other and I shouted out how much fun I was having. No wonder some of my fellow walkers, joggers, cyclers and bladers were hesitant to greet me…or had I presented a menace (?!) with my smiles and hellos? It might have been a different scenario if I had accepted the first comment I received when I first put on my skates in my building’s parking garage. It had taken me a few months to decide to get on some rollerblades, after my girlfriend had suggested we start getting out there in the spring. I had bladed with my husband about 20 years ago in California, where we had decided to buy inline skates because we wanted to try out the then new product. He had been a lifelong ice skater, figure skater and hockey player, while I had remembered my zest to run home from school every day as a child to enjoy free skating at my village arena. Together we enjoyed the most exhilarating experience of skating with some fabulously friendly crowds of people along the ocean seawall in Monterey! 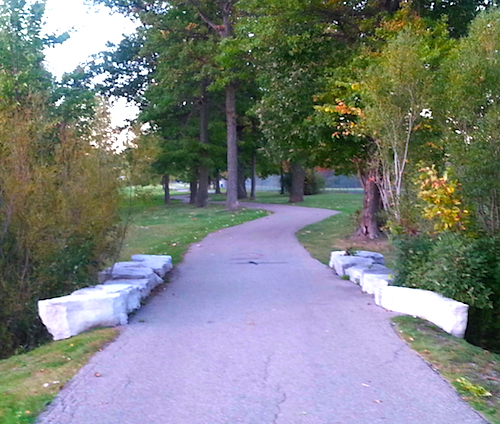 It wasn’t long after I had discovered a long winding paved nature trail in Niagara Falls that I decided to put some skates on again. However, as I was making my first pass around the smoothly finished parking garage, the first comment I received from a disgruntled resident pulling into their space was: “You must really need some exercise.” On the next pass around I was met with their additional remark: “Maybe I should just call the paramedics.” As always when confronted with negativity of any sort, I immediately refused their comment, and then continued to complete the rest of my projected 10 turns around the garage. Now, after several weeks of almost daily practice I’ve gradually progressed to where I’m now confident as I gain momentum and speed and can self-correct my balance with remarkable ease. So, if I had accepted that naysayer’s comment on my very first skate in many years, it might have resounded in my mind and caused me to feel awkward, fearful or even hurt myself. Fortunately, so I never allowed it to affect my progress to become more graceful (?!) on my skates. My rollerblading experience can be compared to our progress in life, as we learn, adapt and acquire the momentum we need to succeed at all levels of our being. While we’re making it happen, let’s share some smiles anytime, anywhere, so we can all enjoy this spectacular ride together!